Even the most dedicated gym rat knows those stubborn areas can be a problem — the saddle bags, the little belly that won’t go away no matter how many miles are logged on the StairMaster. For about five years, Canadians who are slightly apple or pear-shaped have had a weapon to battle those trouble zones that their American counterparts have been waiting for — non-surgical body sculpting. Kellett has weighed people before and after their treatment. She finds that patients don’t lose weight, but they have shed stubborn areas of fat, especially those around the belly or hips. Patients who gain weight after body sculpting will gain fat but it won’t go right back to the target area, she says. Ottawa physician Dr. James Daniel, says the changes are subtle. In fact, a lot of his patients are very fit people, generally in their 20s to 50s, who are frustrated by how difficult it is to get rid of stubborn problem like love handles, or an extra bit of fat on the abdomen or outer thighs. This is not a solution for everyone, Daniel warns. You could not, for example, use this technology to chisel an entire midriff. The technology was developed in Israel, but there are about a half-dozen devices like this on the market. Concept Medical, where Daniel practises, was the first to offer non-surgical body contouring in eastern Ontario, but there are now more. 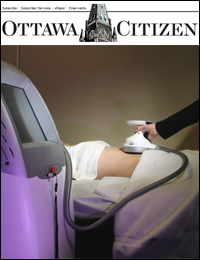 The technology was approved by Health Canada in 2007, but the version he has in his office is the latest model offered by a company called UltraShape. It uses focused ultrasound, which vibrates the fat-cell walls and shatters them. Daniel compares it to Aretha Franklin breaking the wine glass with her voice. It’s different from a pre-natal ultrasound, which uses a divergent beam. The fat cells are metabolized through the liver, which is safe, except for patients with liver disease. The procedure is not advisable for patients who have tattoos in the treatment area because some tattoo inks contain metal that can burn or blister the skin. It also can’t be used on people who have artificial hips or other metal implants in the area, or on those with pacemakers. Patients report there is a warm sensation but no pain. The energy required for each patient is calculated by a computer. After that, it turns into a video game for the technician, and the machine guides the technician. Patients don’t see results right off the table, or even within 24 hours. It takes about six months to see optimal results, says Daniel, although patients often note changes soon after the first treatment. Does it mean you’ll never get a tummy pouch or love handles again, even if you take to your couch and take up a diet of cherry bonbons? The remaining fat cells will pick up the slack, so you need to to maintain a healthy lifestyle to keep the new slimmer you. Daniel often suggests that patients who need to adopt a healthier lifestyle do it before they get body contouring. It motivates them to stay healthy. “It doesn’t replace liposuction, or good general health or a decent exercise program,” he says. He estimates that most patients will lose two to four centimetres after the treatments, about the same as has been reported in clinical trials. Some will lose less, but still feel great. “It’s not a weight-loss device,” he says. “Your contour is better, your jeans fit better. Non-surgical body sculpting is part of a trend that sees consumers turning away from surgery and towards treatments and technologies that are non-invasive and require no recovery time. 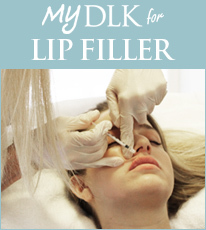 Daniel estimates that only about 10 to 15 per cent of the cosmetic market is surgical now. And patients are getting younger. “I’m seeing 30-year-olds who come in for preventive care,” he says. But on the other side of the spectrum, Daniel is also seeing people in their 60s and 70s who wouldn’t be considering cosmetic treatments unless they were non-surgical. Sessions cost $800 to $1,500 each. A full course of treatment is usually three sessions. Many patients say it’s cheaper than going to a spa because the price is so reasonable. The fact that there is no downtime is another benefit. The technology has not yet been approved by the FDA in the U.S. But when it is, Daniel predicts that the reaction will be explosive. American patients are already visiting physicians in Canada to get access to it. And there is both a bigger market and higher rates of obesity in the U.S.